HP TouchPad to launch without document editing, white version coming? The new trend in tablets appears to be to launch them with incomplete features that will be added in the future. It started with the 4G version of the Motorola XOOM which launched with 3G and is being updated at the factory to 4G connectivity. 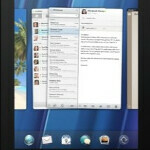 The BlackBerry PlayBook came to market without a native email client and more. Now, a tip received by the guys at PreCentral reveals that an internal HP presentation, meant for HP's corporate partners, said that at launch, documents will not be allowed to be edited on the TouchPad. That means users of the webOS flavored tablet, expected to launch July 1st, will only be able to view Excel, PowerPoint, and Word documents. According to the internal presentation, an update for at least PowerPoint editing will be sent out this summer that will allow the documents to be edited. HP has been pushing hard to get the tablet out so that it could start competing in the suddenly overcrowded tablet market, but had to wait for developers to work on some apps for webOS 3. It came down to HP deciding to launch the device without QuickOffice editing in order to have the product available now instead of waiting more weeks or months before the TouchPad could be found in stores. The 9.7 inch screen on the TouchPad will have a UI optimized to fit the bigger screen and will also be the first webOS powered device with a front-facing camera. The tablet will also have a 1.2GHz dual-core processor and as we earlier reported, can be reserved starting today at a price of $499.99 and $599.99 for a 16GB and 32GB model respectively. Just remember that until the update is received, when it comes to documents on the HP TouchPad, what you see is what you get. But there is some good news. One of the slides shown by HP at the internal presentation hinted at a white version of the tablet. With a picture of the HP TouchPad on the screen, the slide said, "Available in gloss black (shown) or HP dove white finish (not shown)". I know huh? They should not tell the consumers of this information and just let the consumers find out for themselves, right? Are there not editing Apps, such as the few available in the Android Market, that will allow editing if one is willing to pay a few extra bucks? I assumed that even with the new Tab 10.1 and the Ipad that editing was a function one had to pay for to enable it.